Narcissistic Personality Disorder and Testing for It. Please note: We used the Netherlands Narcissism Scale as our test instrument. In its original form (2002), the NNS tested for overt and covert functional and dysfunctional narcissism, but not pathological narcissism, meaning Narcissistic Personality Disorder. The NNS has since been expanded at least once. Its creator, Hessel Zondag from the University at Tilburg in the Netherlands, emailed the document that was used, and we made no changes. The scoring mechanism clearly indicates that the NNS tests for Narcissistic Personality Disorder in both its overt and covert forms. In preparing the original study for publication in a peer-reviewed journal, the journal editor asked me to provide validation by Zondag detailing how the scoring had been calibrated to test for Narcissistic Personality Disorder, which it was not designed to do in 2002. I have been unable to locate such an article, published or unpublished. We relied on the document Dr. Zondag sent us in good faith. Zondag has retired from the University at Tilburg and my attempts to locate and contact him have so far been unsuccessful. Based on the fact that we used the instrument exactly as presented to us by Zondag, we stand by our study. After more than 40 years, I still find working with interpersonal, family, group, and organizational conflicts to be a fascinating and rewarding process. No matter how similar some of the conflicts might sound during first contact, each is as unique as the people within it. Very few of us are able to deal successfully with strong interpersonal conflict for a simple reason: it's personal, which means that our emotions become part of the problem. When we cannot cope by separating the problem from our emotions, conflict has us, and not the other way around. It can seem as if we are caught in a whirlpool that allows us to get close to safety, but then always drags us back and under. That's where people like me come in. Since it is not my conflict, I can see the things that you do not and help you find your way through the dark and threatening places to the calm of an early summer morning. I have worked with all types of organizations (see the column at left) but my passion for conflicted faith communities is paramount. My role is not to tell anyone what to do, but to help people find their own solutions, as your solution will most likely work better than mine. So, give me a call or drop me an email (darrell@conflicttopeace.com). You can't lose what you don't have! Let Us Prey: The Plague of Narcissist Pastors and What We Can Do About it. Let Us Prey: The Plague of Narcissist Pastors and What We Can Do About It, is now available worldwide in hardcover, paperback, and Kindle editions at Amazon, Barnes & Noble, and other online booksellers. A link to it at Amazon: Let Us Prey! Glenn and I were as shocked as anyone when the results of our survey of pastors in Canada came back. We had embedded the Netherlands Narcissism Scale in a larger instrument. The NNS is a validated test for overt and covert narcissism and was sent to us by its author, Hessel Zondag of the University in Tilberg, The Netherlands. Based on the scoring system, the NNS also identifies pathological narcissism in what is called Narcissistic Personality Disorder, one of the most destructive and least treatable of all mental disorders. The results: 26% scored in the diagnostic range for overt NPD, and 5.2% scored in the diagnostic range for covert/shy NPD, for a total of 31.2%. The numbers have been tested and retested, and they are correct. However, see the notes to the left. "Armed with research data and real-life examples, Puls and Ball provide an absorbing and alarming analysis of Christian clergy who suffer from Narcissistic Personality Disorder, describing the toll these 'wolves in sheep's clothing' wreak upon their congregations and co-workers. A must-read for clergy and those who supervise and support them." ~ Kevin Livingston, Associate Pastor of Pastoral Ministry, Tyndale Seminary, Toronto. 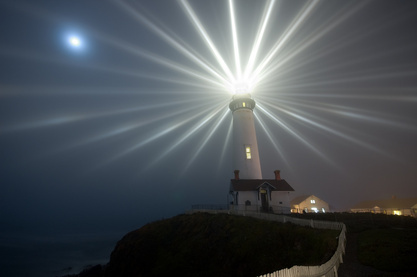 "Ball and Puls do an amazing job of bringing a sensitive issue to the light. Filled with powerful stories, up-to-date research, and godly counsel, Let Us Prey is a great resource that brings wisdom, guidance, and healing to Christian leaders and church communities." ~ Tim Clinton, President, American Association of Christian Counselors. "Let Us Prey contains ground-breaking research regarding the plague of narcissism in the church. It also provides practical direction in the diagnosis, intervention, and mitigation of narcissism in our pastorate and our congregations. A must-read. . ." Michal Patterson, Chair, Department of Behavioral Sciences, Corban University. "Painstakingly researched and terrifyingly realistic, this book shocks us into facing up to the monsters within the body of Christ who prey on the sheep rather than pray for them. Read it and equip yourself to identify and confront these predators with firmness and faith." ~ David Murray, Professor of Practical Theology, Puritan Reformed Theological Seminary. Let Us Prey will be available at Amazon, Barnes & Noble and booksellers worldwide very shortly in paperback, hardcover, and e-book editions. 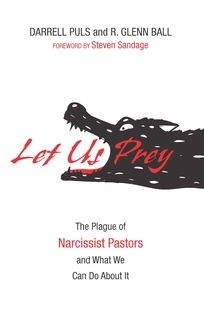 Let Us Prey: The Plague of Narcissist Pastors and What We Can Do About It! "Glenn and Darrell, Thanks for this groundbreaking work. It will be a privilege to have it in our Cascade imprint, as it shines a new light on a real problem for churches. I suspect many will recognize the phenomenon of narcissism, but will benefit from having it named and identified. In addition, you give sage and thorough advice on how to avoid hiring a narcissistic pastor." The Road Home is the companion book to Let Us Prey. Any faith community that has experienced a toxic narcissist pastor is wounded, bewildered, and hurting. 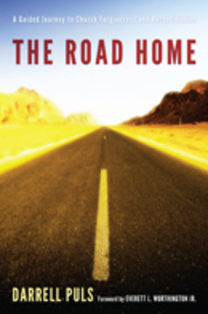 The Road Home is a guided journey into deep and lasting healing and is designed specifically for wounded congregations. Available worldwide in paperback, hardcover, and Kindle.